Recently, a client we are working with on a kitchen remodel asked if mixing finishes in cabinetry is okay to do. Yes, mixing finishes is perfectly okay as long as it’s done properly. It is a great way to give a kitchen a fresh twist. You can go from super modern to eclectic depending on how you mix the colors and finishes on the cabinets. First, the least risky option is to change up the island cabinet color. The main color palette can stay neutral so that you are not taking a huge design risk. You need to keep the perimeter cabinets light and the island dark. This will make the island the stand out as a centerpiece of the kitchen. The second option for mixing kitchen cabinet finishes is to paint the wall and base cabinets different colors. 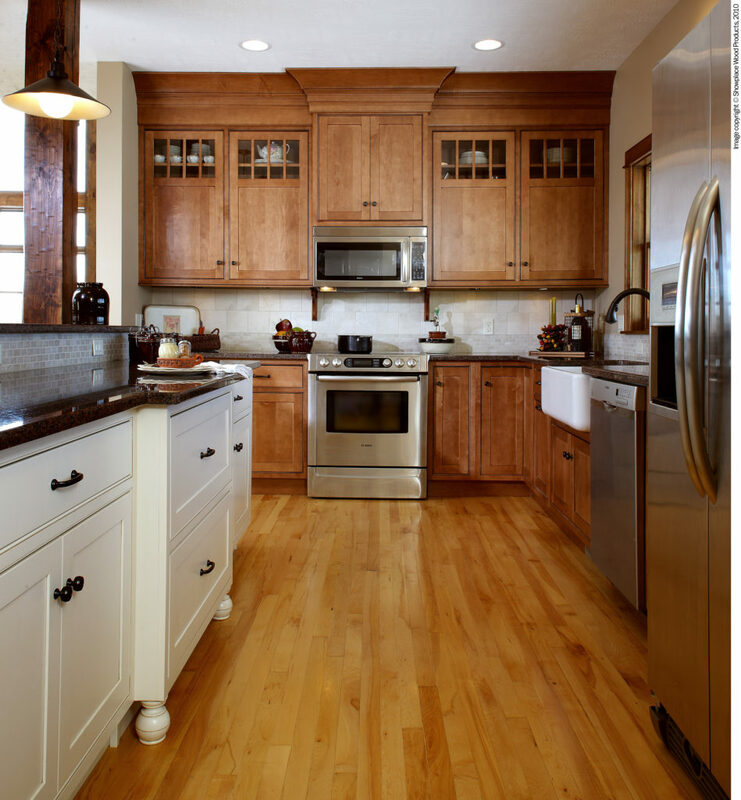 The best rule of thumb is to keep the upper cabinets light and the base cabinets dark. This will put the weight on the base cabinets, but it is not a rule written in stone. A classic way to do this is to keep the wall cabinets white and crisp and go with another neutral, like a grey, on the base cabinets. This is a fresh and modern twist on a white shaker kitchen cabinet look. The third option is the modern look. Try pairing a light to medium wood-tone cabinet with a stainless steel and opaque glass cabinet or a high polish lacquer cabinet. You can also mix it even further by replacing some wall cabinets with dark floating shelves to push the modern finish mixed look even further. There is no perfect “rule” for the right proportions for mixing finishes. Take some risks and mix it up. Try adding a different color here and there like a range hood, sink base, or a hutch area. If all of that is still too much risk for you, then try adding color to the inside of a cabinet. No one will know it’s there but you!